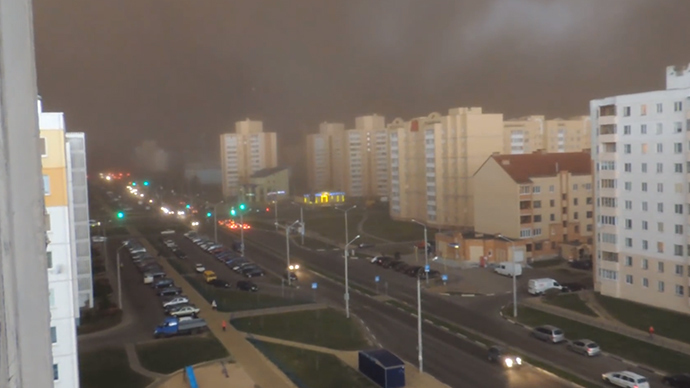 An “apocalyptical” storm swept through several regions in Belarus, including the capital. But it was in the city of Soligorsk where clouds as black as ink obscured the sun light, while strong winds ushered in a sand storm. Soligorsk residents, about 120 kilometers from the capital Minsk, were both scared and excited by the weather phenomenon that hit Belarus on Monday. At around 17:00 local time, darkness descended on the city with over 100,000 residents opting to stay indoors. People reportedly had to move around several districts with flashlights. The storm’s heavy rains led to electricity being cut off, trees falling down and damage to buildings. The country’s Emergency Ministry reported about 46 communities in the Minsk region suffered various kinds of damage. The capital city was also hit by storm force winds and torrential rain, but no emergency situations were reported. The epic storm was created by a cold front on the Ukrainian-Belorusian border that later reached the Carpathian Mountains in an event that is quite rare for this time of the year. Meteorologists called the natural phenomenon a “haboob,” which means an intense red dust storm in Arabic.